Vertical forests in the Sahara? According to a recent article in the New York Times on “The Allure of Vertical Forests,” cities currently cover about 3% of the Earth’s land. However, some forecasts say that population growth and migration could push that proportion up to about 10% by 2030. And it’s pretty certain that almost all of that will go into sprawl of existing urbanization over surrounding woods and fields. No amount of vertical forests or inside gardens, no matter how good, can compensate for the loss of such green space and arable land. So what is the possibility of building new cities – including vertical forests – in marginal lands where food crops and shade trees aren’t otherwise so easy to grow? Even in the middle of the Sahara – perhaps surrounded by expanses of solar panels and wind turbines, and pools of desalinated water, if we are to accept the feasibility of some schemes? The vertical forest, which is the idea of architect and urban planner Stefano Boeri, is actually intended to help offset some of the intense use of resources and production of carbon dioxide in urban centers – while improving the living environment for people. Such towers have been built in or conceptualized for existing cities, each project unique to its location. 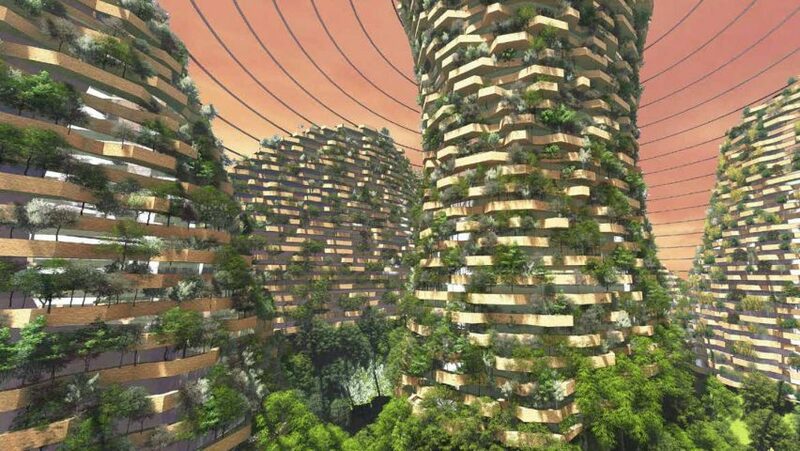 It is interesting to note that Boeri has also developed a conceptualization of vertical forests in domed cities on Mars. Readers of this blog may recall my contention two years ago that schemes for settling Mars – whether or not they will ever be realized – should at least be prefaced by experience with new cities in Earth’s harshest deserts. In that post, I highlighted another concept by OXO Architectes for a tower city designed specifically for the Moroccan desert. So on a very Earth-bound, practical level, should we encourage more green tower concepts for new cities in deserts like the Sahara – concepts that could in effect help “green the desert” through sustainable urbanization? A hidden class of “bike-to-workers”? unavailability of bike racks, which seems to affect the latter most. The question is whether there is a kind of second class of bicyclists overlooked both by events such as Bike to Work and by longer-term planning and installation of infrastructure for bicycling. First, about Bike to Work Day – it is part of the League of American Bicyclists‘ initiative for National Bike Month and National Bike to Work Week (15-19 May this year), all of which apparently go back to 1956, as ways of promoting bicycling. In the Washington, DC area, which concerns me in this case, Bike to Work Day is a popular and well supported event, with volunteers working “pit-stops” on bike routes, food and drink available, and giveaways. Altogether a great way to encourage commuters to at least try bicycling, or to get back on their bikes as weather warms up. But what about people who bike to work pretty much every day on less frequented routes?. Several years ago I observed in Vienna, a northern Virginia suburb of Washington, how there seemed to be two separate groups of bicyclists – one with better bikes perhaps in lycra, often seen on the bicycle-friendly W&OD Trail, and another with less expensive bikes, perhaps in jeans, more likely seen along the commercial main street. The latter group apparently included people commuting to lower paying jobs in shops and restaurants. Although I was not able to verify this through any systematic research, one did notice here and there bikes locked up behind or near shops. Also, research done by others has noted use of bicycles by “day laborers” in northern Virginia (a situation perhaps similar to what one finds in other areas like Los Angeles). What brings me back to this topic is noting recently – or really taking the time to notice – bikes locked to trees in a couple of shopping centers near another northern Virginia suburb, Falls Church. This is actually not that uncommon, but often easy to miss (as for instance the photo below on right, where the bikes were in an area screened from the shops). It is my impression that there are relatively few shopping areas that have bike racks or installed stands for parking bicycles. The same was true of Vienna – where I recall personally having to lock up my bike against sign posts or railings when going into a store – and of Falls Church, especially outside of the downtown area (where some bike stands have been installed by the city). One can easily get the impression that bike racks are a priority only in certain higher traffic areas and/or with certain types of cyclists in mind. Or at best that their locations are not thought through too thoroughly. Running an errand one Sunday midday along the main street of Falls Church, I noted several empty bike stands (two of which pictured above), but then a little farther away, two bikes and a one-wheel trailer locked up against an awning support in front of an eatery. Which areas do get them, and which simply don’t. Within the areas that do, how well placed they are for people to use. On both levels, there are decisions about either public expenditure on racks or ordinances requiring residential or commercial properties to include provision for bicycle parking and locking. 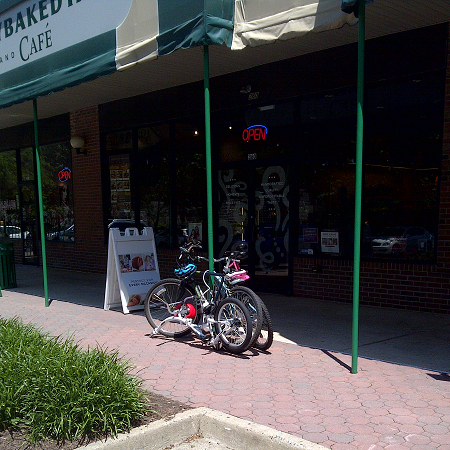 Within the city of Falls Church, there is a bicycle master plan that considers placement of racks. Outside, it is apparently another matter (both of the locations with bikes locked to trees happened to be just over the boundary in Fairfax County, a huge jurisdiction). Who counts in planning for bicycles? It’s not a coincidence that the pattern of provision for bicycle parking – racks or stands – facilitates certain kinds of use of bicycles more than others. The higher level regional planning for bicycle infrastructure, processes of input into policy, and the local decisions about what is installed where for bicycles all seem to happen without input from people who ride bikes to a local job where they have to lock them to trees or fences or whatever. Those same people are also the ones for which just about every day is a bike to work day. Admittedly, part of the issue is numbers. If only a couple of people ride bikes to each small shopping area, it is not likely that they’ll get a rack for parking. On the other hand, a couple of bikes each day represents a steady traffic, perhaps enough to justify putting in some kind of rack. Still, it would probably take shoppers and restaurant clients biking in some numbers and complaining about lack of places to lock their bicycles for there to be a change. It shouldn’t have to be that way. Another perspective is that adding bike racks in places where one sees bicycles locked to trees and whatnot would in addition to helping those less visible cyclists, also facilitate more people biking to those locations. Elon Musk’s introduction of SpaceX’s plans to go to Mars was long on the how to get there, but short on the “now what?” once passengers land. What would cities on Mars look like, and how would they solve the material and social challenges they would encounter from the moment they arrive at their destination? A practical place to start looking – and planning – would be Earth’s driest deserts. It’s not by whim that scenes in the 2015 movie The Martian were filmed in the barren Wadi Rum of southern Jordan. While no place on Earth is really comparable to Mars, the most arid areas are as close as one can get in many respects. 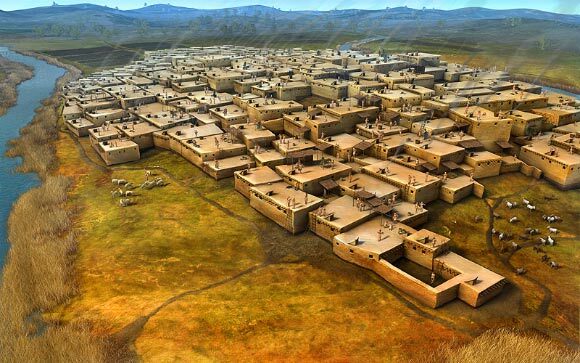 Urbanization in sparsely populated “deep deserts” – areas away from water sources where most ancient and modern desert cities are located – is a path we will have to consider in the wake of population growth and environmental change. But such urbanization will need to be much more concerned with water conservation and efficient protection from the harsh climate than say Las Vegas or Dubai. The technologies necessary for creating sustainable communities in these harsh arid environments exist, such as solar and wind power, water recycling, thermal insulation, and food production in controlled and even vertical environments. Their combination and application in deep desert cities would have benefits for humanity on Earth – and potentially on Mars. In fact, if SpaceX’s (or any other) Mars venture really is to take flight, its organizers would do well to have first collaborated on development of cities in deep deserts. Many technical issues could be worked out which could both be scaled on Earth and implemented in Mars colonies. Examples of potential candidates for such collaboration might include the French architectural firm Manal Rachdi OXO Architectes which has a concept for a city-in-a-tower in the Moroccan Sahara, and Masdar in the United Arab Emirates which has a plan for a sustainable city in the desert there. Beyond the relatively straightforward (which is not to say easy) engineering problems of getting to Mars or creating a sustainable built environment, are a range of social, cultural, linguistic, health, and governance issues that will arise where hundreds or thousands of people are housed in a more-or-less self-contained habitat. Better to have a practical experience dealing with such issues closer to home before attempting to do the same on an another planet.